Black and Red Quartz Alarm Clock. 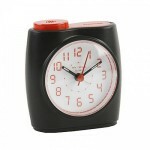 Black and Red Quartz Alarm Clock. Sweep second hand so silent operation Function: Bleep alarm Snooze facility Light. Requires 1 x 1.5 volt battery (type UM3/R6/AA) not included. Size approx; 8.5cm wide x 9.5cm high. .. 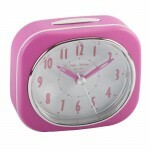 Pink Alarm Clock Pink alarm clock. Sweep second hand so silent operation Function: Bleep alarm Snooze facility Light Requires 1 x 1.5 volt battery (type UM3/R6/AA) not included Size approx; (w)8cm x (h)7cm x (d)3.5cm ..